Business hours: 7am-9pm. Closed on Monday. 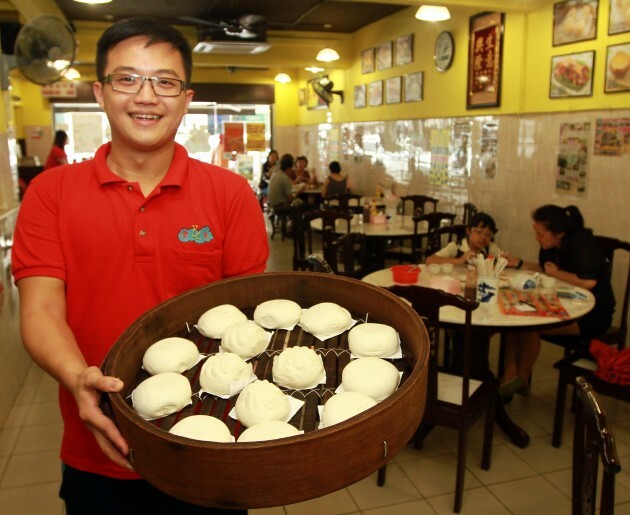 Third-generation business churns out tasty pau and dim sum at its 25 branches. THOSE on a search for good homemade pau and dim sum might find Restaurant Yun Lai Dim Sum’s offering just what they were looking for. A third-generation business that started with a small stall in Kulai, Johor, is today well-known for its variety of pau and dim sum. Its owner Martin Tan said his family including his aunties and uncles operate 25 branches including their first eatery in the Klang Valley, which is located in Subang Jaya. “We are keeping it within the family as we realised that several branches that were run by outsiders did not do too well,” he said. Restaurant Yun Lai Dim Sum owner, Martin Tan. Tan said the family had modified his grandfather’s recipe by omitting baking powder from the list of ingredients for the pau. The first thing that will strike you when you see their version of pau is that the top of the pau is not too rounded and a little flat. “Our signature Imperial Dou Sha Bao (red bean pau) costing RM1.80 each and Cha Siew Bao (sweet roasted pork pau) (top pic) costing RM2.10 each, are the most popular ones at our restaurant. “At the Subang branch, we can sell about 1,000 pieces of the red bean pau in a day while in Johor, we can sell about 20,000,” said Tan. Tan said the family decided not to use baking powder for health reasons. 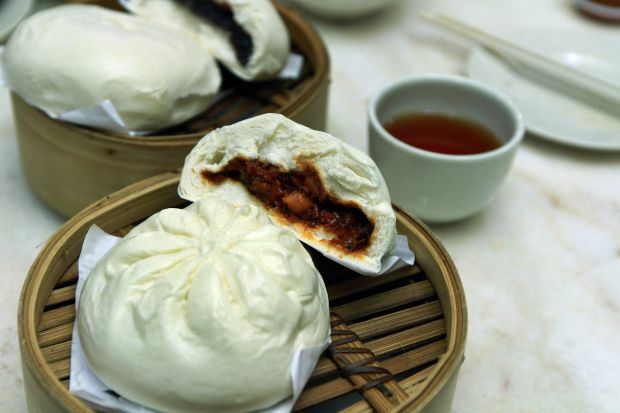 “People usually feel full after eating one pau that is made with baking powder. “So this way, they will be able to try other dishes without feeling overwhelmed. “Some people also do not like the smell of baking powder,” he said. As a replacement, they use a mix of low- and high-protein flour as well as multipurpose flour. One bite into the red bean pau will tell you why this sells like hot cakes. It is soft and smooth on the outside and the red bean paste is nice and thick. “At midnight every day, the red bean is cooked in huge batches for seven hours, in Johor, before sent over here. “We have to make sure not to overcook the beans, otherwise there will be a burnt smell,” said Tan. The tasty and rich in flavour Cha Siew Bao does not have pork belly among the ingredients, Tan boasted. A pau specially made for Kuala Lumpur folk is the Royal Golden Bun, which has custard and salted egg in the filling which strikes a balance of sweet and salty. Tan said regular customers would walk in and order the ‘Fantastic Four’ combo — the Imperial Dou Sha Bao, Cha Siew Bao, siew mai (RM5.50 for four pieces) and steamed rice rolls (RM6). 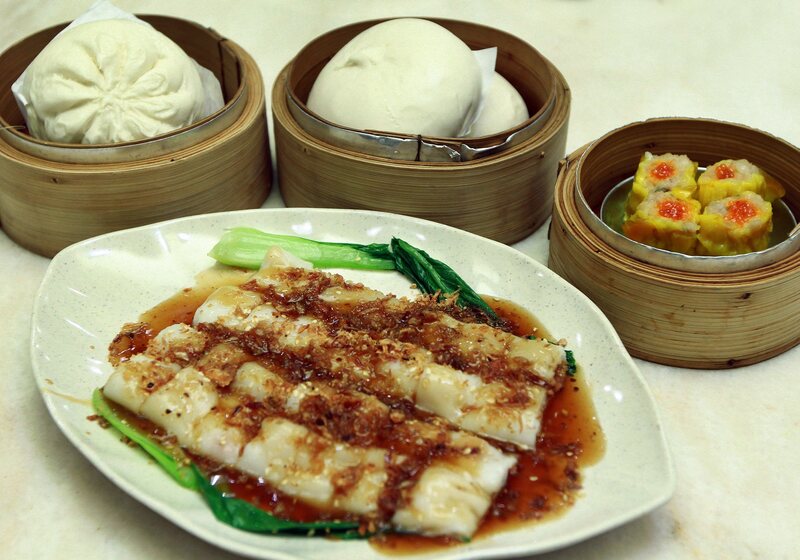 The “Fantastic Four” that regular customers would order at Restaurant Yun Lai Dim Sum. “Our customers love our steamed rice rolls because of the smooth texture and the sauce. Most other places use only soy sauce to go with the dish. “We combine soy sauce, oyster sauce, sesame oil and a little salt and sugar,” he said. The siew mai was flavoursome and the best part is that it did not fall apart when sticking a fork into it, a common problem I face when eating this dish. “Most places only use pork and shrimp but fish was added to ours as its sticky texture is supposed to hold the pieces together to prevent it from separating when steaming,” he said. A personal favourite was the Herbal Chicken (RM5.50) dish as it reminded me of my mother’s herbal chicken soup. “We boiled the soup with red dates, wolfberries, dang shen (poor man’s ginseng) for six hours and added the chicken after that,” he said. The soup was bursting with flavours and the chicken meat was tender. 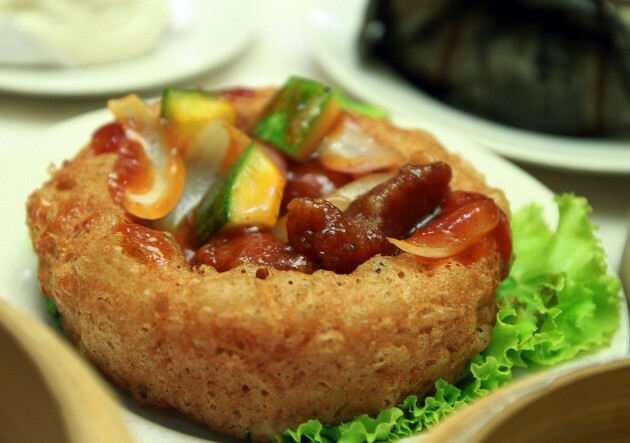 There are also a variety of homemade noodles and other fried dishes such as the Golden Yam Ring. Deliciously crispy, Golden Yam Ring. Tan said alkaline water was not used to make the noodles, a common practice used to prevent noodles from going bad.